RIFTEK, represented exclusively in the UK & Ireland by Ixthus Instrumentation, recently designed and supplied a customised scanning system that automatically measures and records geometric parameters for welded cylindrical laminated foil tubes. 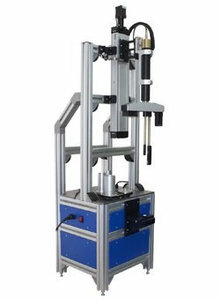 The RF092 machine employs three RIFTEK laser triangulation sensors that are rotated around the sample tube and combine to measure the multi-layered foil thickness as well as the weld overlap and depth, in addition to the tube length and its diameter. Manufactured using ABL or PBL (aluminium or plastic barrier laminates), these types of tubes are extensively used for packaging pastes or gels such as cosmetics, toothpaste and more aggressive materials where leakage of any kind cannot be tolerated. The tubes are typically formed and sealed by an axial weld and the machine was commissioned by RIFTEK’s customer as part of a quality control procedure that helps ensure they meet the appropriate EN 13461:2009 manufacturing standard. The rotating laser scanning principle developed by RIFTEK builds upon other systems for the measurement of inner diameter and tube parameters using triangulation sensors that are more commonly associated with linear distance measurement - but are nevertheless proving to be a competitive alternative to other forms of cylindrical geometry and thickness measurement. The automated machine is supplied complete with motorised linear and rotary positioners that present and align the sensor head so that the tube axis centreline coincides with rotation axis. The machine includes calibration cylinders for three tube diameters to suit the customer’s current production programme although more sizes could easily be included. On completion of an automatic cycle to measure and record the data the results displayed on a GUI with a PC connection via Ethernet to upload information for storage or further analysis. The measured parameter specifications for the RF902 include diameter from 13 to 50 mm with accuracy to +/- 10 µm, foil thickness range from 0.05 to 0.5 mm with foil and weld thickness accuracy to +/- 5 µm, as well as length accuracy to /- 0.1 mm.